In the Middle Ages, King David was considered to be the author of the psalms, leading to the frequent inclusion of the Tree of Jesse in psalters. 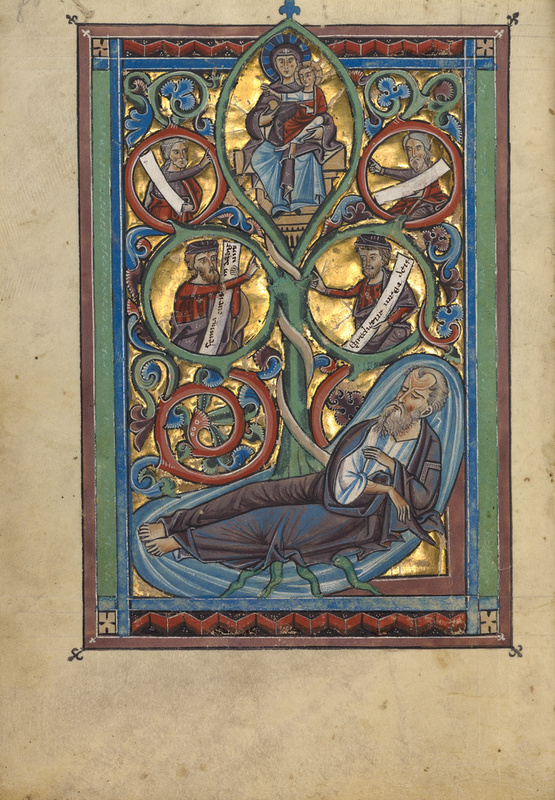 In this manuscript, the tree is one of a series of full-page miniatures preceding the text of the psalms. The genealogical diagram of Christ's lineage from David's father Jesse was inspired by Isaiah's prophecy: "There will come forth a rod out of the root of Jesse and a flower will rise up out of his root." The rod (virga in Latin) was interpreted as the Virgin Mary (virge Maria in Latin) and the flower as Jesus. In this image, as was traditional in representations of this theme, Jesse appears as the root, from which sprouts a tree supporting the Virgin and Child. Above Jesse, two prophets hold scrolls with verses that were understood to refer to the Virgin. Along with two prophets whose scrolls were never filled in, they point towards the Virgin and Child. At the top of the tree, the Virgin presents an orb, symbol of the Messiah's dominion, while Jesus raises his hand in blessing.